Bali 3/8" Double Cell Honeycomb Blackout Cellular Shades feature a sophisticated visual focal point for your space with energy efficiency and sound insulation material that surpasses any other contemporary window treatment. The insulating double cell shades prevent heat transference to help lower energy bills year round and the blackout fabrics provide maximum privacy and block all light. Perfect for bedrooms, bathrooms and nurseries. Coordinate with VertiCell™ Vertical Cellular Shades to add matching style to patio doors or wide windows. 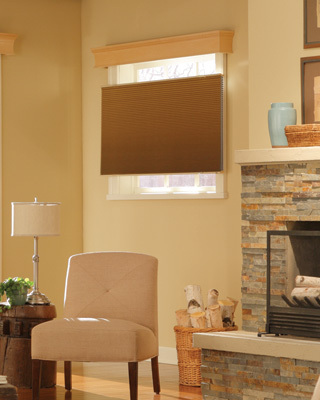 Select fabrics are now available to accommodate your largest windows, and virtually all fabrics are now available in cordless cellular shades to reduce accident hazards in homes with children or pets. The New Bali Collection of Cellular Honeycomb Blackout Shades contains inspiring fabrics and exciting colors. Wood valances and cornices are optional, are crafted from the finest hardwoods, and are finished with master-furniture quality paints and stains. Cordless Shades cannot be longer that 64" in height. Hold Down brackets are used to secure the bottom of the shade.